The lastest smartphone marketing strategies of Korean smartphone makers is the alliance with game industry. Mobile games are the best content to experience the high-end specifications of smartphones, making it a win-win opportunity for both sides. On the 4th, LG Electronics announced that it will give Nexon's mobile MMORPG 'Kaiser' game item worth KRW 150,000 as one of the benefits for its customers to commemorate the launch of its next strategic smartphone 'LG G7 ThinkQ'. One of the four accessory packs that are sold separately is Nexon Kaiser Pack. The Nexon Kaiser pack consists of a 250,000 won Kaiser game item, two leather and hard cases, a spare battery and a cooler mount. LG Electronics launched the Kaiser App in the LG G7 Square, an experience zone that was opened to the public on April 4, and provided a place to experience the Dark Avenger 3 that was launched before. LG Electronics has been concentrating on game enthusiasts, mainly by cooperating with Nexon, such as providing the overheat experience zone which is packed with 200 V30 phones at 'G-Star 2017' held in Busan last year. Samsung Electronics has also provided game items through partnerships with domestic game companies at the time of new product launches. 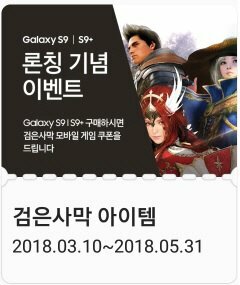 During the launch of 'Galaxy S9' this year, they worked with Pearl Abys to provide MMORPG 'Black Desert Mobile' game items as well as to optimize the game on the big screen through the mobile accessory Dex Pad. At the time of the launch of Galaxy S8 and Galaxy Note 8, Samsung Electronics has been promoting similar forms of joint promotion such as the Lineage 2 Revolution item of Net Marble Games. An official of LG Electronics said, "The game is the tool that enables users to experience the smartphone display and sound quality at once." Game users do not simply replace the smartphone for games, but when purchasing a new smartphone, it is important to consider the specifications associated with the game". Meanwhile, marketing using popular messenger characters is also popular in Korea. 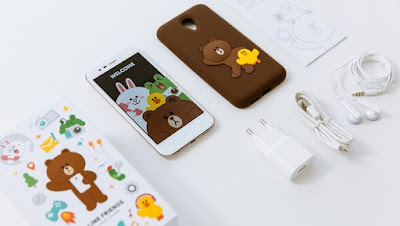 As one of the accessory packs that customers can choose from, G7 ThinQ users will be presented with a "Line Friends Pack" that includes a case with linefriend characters, a wireless charger, and earphones. Samsung Electronics presented Galaxy S9 pre-buyers with a case of applying Ryan characters from Kakao Friends, while also offering the opportunity to purchase a Ryan Recharging Stand at 5,000 won.